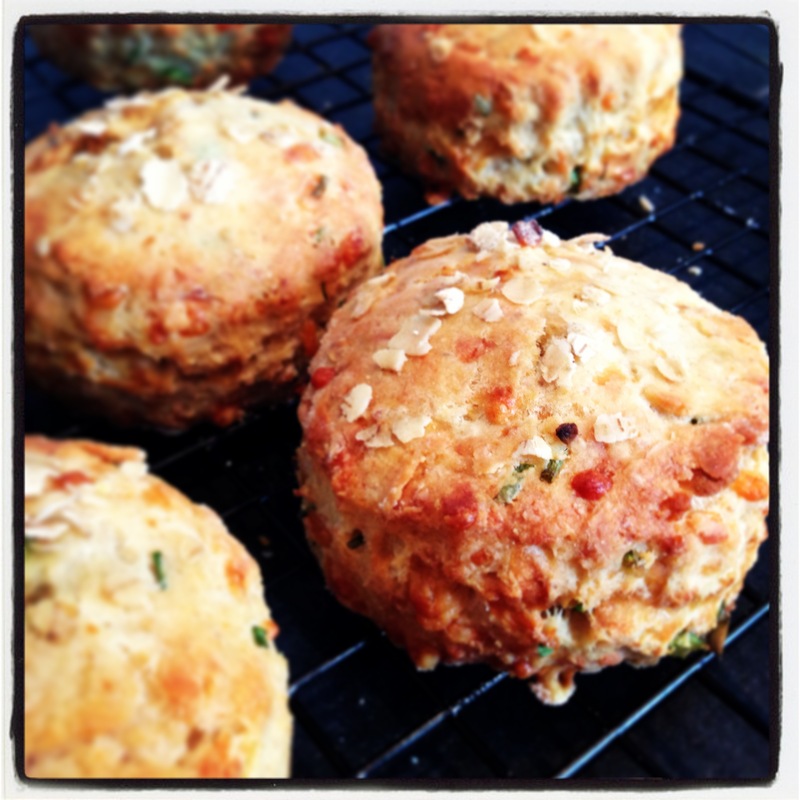 There’s something so homely about cheese scones that I’m not sure anything can beat them on the comfort food front. I love making them on chilled out Saturday mornings, and my mum even makes them for us fresh on Christmas morning. Her classic recipe from an old Bero cookbook is probably still my favourite, but a couple of years ago I came across an alternative, more substantial version by baking maestro Dan Lepard for the Guardian. This is what I’ve adapted below, exchanging the buttermilk for good old semi-skimmed (or whatever you have in the fridge) and the parsley for chives. With a hell of a lot of cheese in there, these certainly aren’t one for diet days but they make a perfect brunch dish when you’re not feeling quite so extravagant as pancakes and you don’t fancy eggs (as I never have and never will). 1. The first stage of this recipe sets it aside from any other scone recipe I’ve known; a porridge style mixture is made by combining the oats with the water in a saucepan and bringing to the boil. At this stage, pour the mixture into a large bowl, stir in the milk and leave to cool. 2. Pre-heat the oven to 220c/200c fan assisted/425F/gas mark 7. 3. Beat in the egg and oil until mixed well and stir through the cheese and chives. Next, add the flour, baking powder and salt, mixing until a soft dough forms. 3. Roll out the dough on a floured surface until around 4cm thick and use a round 6-8cm pastry cutter (I like the ribbed edge best) to form the scones before transferring them to a floured baking sheet. Place them a few centimetres apart to allow for a little spreading. 4. Brush the tops with milk and sprinkle over a little grated cheese and some more oats for a rustic, homely finish. 5. Bake for 15-20 minutes until the kitchen smells divine and they are risen and golden brown. Transfer to a wire rack. 6. Enjoy! These are best straight out of the oven with a generous serving of real butter. Later on, a gentle toasting brings them back to life and they freeze pretty well too. Categories: Books, Dining in, Uncategorized | Tags: baking, Bero, brunch, cheese, cheese scones, chives, Christmas, cookery book, Dan Lepard, Glasgow, Guardian, home baking, Saturday, scones, Scotland | Permalink.